Situated in the Coach Trail Villas in the quiet little village of Waiwera. This is our personal holiday home. It was originally the honeymoon suite of the Coach Trail Villas and is a wonderful place for a couple to get away and relax. It is called The Attic and the bedroom, situated upstairs, is a spacious, quaint attic style. There is a fully equipped kitchen, bathroom and laundry, with all the comforts of home including WiFi. There are books to read and a collection of DVDs is available to watch. Having a front and back deck ensures you can take full advantage of great weather. Waiwera means hot water and the apartment is in a complex with a thermally heated spa and swimming pool. The pool is warm enough for year round swimming. This pool area is for paying guests only and all guests are expected to be considerate of the other residents and follow the pool rules. A short walk to the lovely quiet beach where you can swim, kayak, paddle board etc. There are many sea birds breeding on the beach. The apartment overlooks Wenderholm Regional Park which is a 5 minute drive or 20 minute walk and offers scenic walks with abundant bird life. Close to Orewa which offers an abundance of shops, restaurants and a popular beach. Only 30 minutes drive from Auckland City. Many farmers and craft markets nearby at weekends. The quaint and historic Puhoi village is a 10 minutes drive away and is well worth a visit. Many beautiful, scenic walks close by. The well stocked dairy across the road is sure to have whatever food items you have forgotten. This apartment is not serviced and guests are expected to bring their own linen and towels. When this is not possible, linen can be provided by negotiation with an extra charge. Guests are expected to leave the apartment as clean and tidy they found it for the next guests. The swimming pool is shared by all residents and users are expected to be considerate of others. As this is an Attic Apartment, there are stairs to the unit and to the bedroom. These are not difficult to manage, but please bear in mind if you have mobility issues. This apartment is not suitable for children. Extras: Linen (Optional, NZ$30.00 per stay); NOTE: Under Kiwi bach tradition you are expected to: Clean the house, empty bins and do the dishes before you leave. Originally from South Africa, we have lived in NZ since 1999 and love our adopted country. We have 2 adult daughters, both married and one incredible baby grandson. We bought this property when our daughters left home. We live and work in Auckland and purchased this property as a place to escape, explore and relax. it has been a real blessing to us and we enjoy being able to share it with others. We find being near water to be relaxing and the lovely water views made us fall in love with this apartment . Waiwera really appealed to us as it is such a small community and not commercialised. We are often the only people on the beach. The people in the community are friendly. We enjoy walking on the beach, kayaking, swimming and bush walks, all of these are easily available here. Having a thermal water pool and spa was a bonus. A front balcony with estuary and sea views and a cool shady back deck for relaxing on hot days. Thermal pool and spa within the complex. A short easy walk to the beach for a swim. Waiwera is situated in a rural area. There are lovely drives to take to admire the scenery. Located in the small, quiet village of Waiwera. There is a dairy and cafe/pub in Waiwera. The church is open on the first Sunday of each month. The thermal pool resort is currently under renovation. Lovely view of the estuary flowing into the sea and the beautiful Wenderholm Nature Reserve. Heaters available in living area and bedroom. Electric blanket on bed. One car parking at the from of the building. The parking is labelled "The Attic". Wifi password can be provided on request. Comfortable living space with couches. Coffee and tea sachets are available. Margarine and marmalade are in the fridge for use. Crockery, cutlery, casserole dishes, baking trays, pots and pans all available. There is a slow cooker available. Part of the open plan living area. Well equiped. The dining area seats 2 people. There is also a table for 2 on the front deck and a bigger table and benches on the back deck. Situated in the TV cabinet. There are stairs to get to the apartment and to the bedroom within the apartment. Thermal water so you can comfortably swim all year round. Thermal water. Refills numerous times through the day so is always hot. Lots of stairs but clean and tidy! Quiet out of the way, easy walk to the beach, clean and tidy but lots of stairs!! The apartment was tastefully decorated, clean and tidy. It had all the facilities to make our stay very enjoyable. The thermal swimming pool and hot tub were a bonus. Sitting on the small terrace with such lovely views was very relaxing. So pleased you enjoyed your stay. Thanks for leaving the apartment so clean and tidy. Enjoy the rest of your holiday in New Zealand. We had a lovely and relaxing time at the Attic. Thanks for the bottle of wine and it was lovely. Can't wait till our vacation there! Had a wonderful relaxing weekend. The Attic is well equipped and very homely. Great views. Weather was good. Did a lot of walking and sightseeing. Thank you. The attic is a lovely little home away from home with all the comforts of home. The attic is a lovely little home away from home with all the comforts of home. It is perched on top of the complex and has wonderful views. Will definitely be staying there again. The property was lovely and homely. The property was lovely and homely. It had everything you needed to have a relaxing time and the thermal spa and pool were just wonderful after a long day. Would recommend this property if you are looking for somewhere to chill and unwind. The Attic is walking distance to the sheltered Waiwera beach with calm water for swimming, kayaking etc. 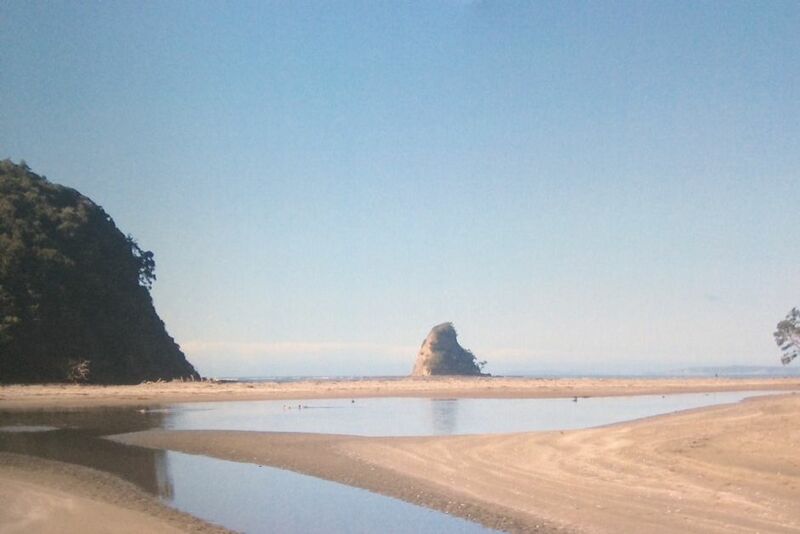 Waiwera beach is always very quiet and the endangered dotterels can be seen nesting there. The Wenderholm Nature reserve is a pleasant walk away and filled with Native Birds. The historic Couldrey House is situated at Wenderholm and is well worth a visit. Orewa is a 5 minute drive away and is full of really good restaurants and a range of shopping options. Heading North, there are lovely wine estates with fantastic restaurants and quaint areas to visit. Puhoi is an interesting community and the Cheese Factory is well worth a visit for lunch or an award winning ice-cream. The Sculpture trail at Brick Bay is always changing and is a very pleasant hours walk. Matakana has a great farmers market on a Saturday morning for lots of tasty treats. The movie theatre there is also worth a visit. There is an excellent bus service from Waiwera to Orewa and to Auckland city. The pick up is directly opposite the apartment.